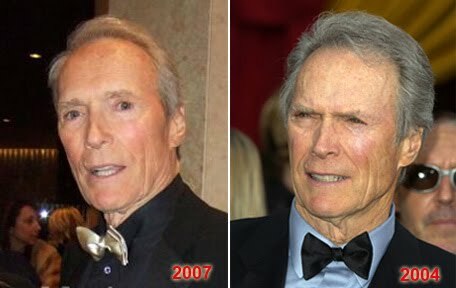 Clint Eastwood before and after plastic surgery? Clint Eastwood is a legendary film star who is known for having rugged good looks and a trademark squint/scowl that sends the bad guys heading for the hills. Recently i noticed that a couple of other plastic surgery websites are speculating about whether or not Clint Eastwood went under the knife for plastic surgery, so let me be the first to say "myth busted"! Looks to me like the before and after photo is a complete comparison fail, we see Clint in 2004 with his classic squint expression and then in 2007 he was clearly startled by an unsuspected camera flash. Which ultimately resulted in "spooked" appearance. No facelift or eye work here. This blog is about showcasing celebrities who have undergone plastic surgery, but we also like to talk about famous people who haven't had plastic surgery, despite rumors and speculation.